Centerprise International staff have raised thousands of pounds to support a charity that provides trained dogs to injured servicemen and women. 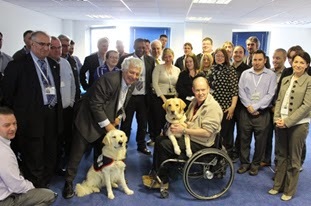 Gulf war veteran Allen Parton paid a visit to Centerprise’s Basingstoke headquarters to personally thank employees who raised £5,000 for his charity, Hounds for Heroes. The money was raised with a series of activities throughout the year. A race night at Basingstoke Rugby Club was the biggest earner, bringing in £3,500, while Centerprise staff raised £1,000 by taking part in the Reading Half Marathon. Activities ranging from Halloween pumpkin carving to sweepstakes and raffles helped the fund reach the £5,000 milestone, and Centerprise’s chairman Rafi Razzak boosted the total by writing a cheque of his own for an additional £1,000. Hounds for Heroes, based in Clanfield, Hampshire, was founded by Mr Parton, who suffered a serious head injury in the aftermath of Operation Desert Storm. It provides specially-trained assistance dogs to injured and disabled men and women of both the UK Armed Forces and the civilian emergency services. They can help disabled veterans with everyday tasks such as emptying the washing machine and doing the shopping. The charity now has 22 dogs – which it calls “cadets” – at various stages of the training process. The money raised by Centerprise will fund the purchase price of a dog and its training for at least two years. Mr Parton said: “I’m very grateful to Centerprise for its support. Just knowing that people care makes all the difference.